The seeds of Hi Little One first sprouted when Nell of sister duo Maggie and Nell struggled to find the perfect gifts for her friends’ newborns – something that struck the right balance between unique and not too cutesy, being a single 26-year-old herself. 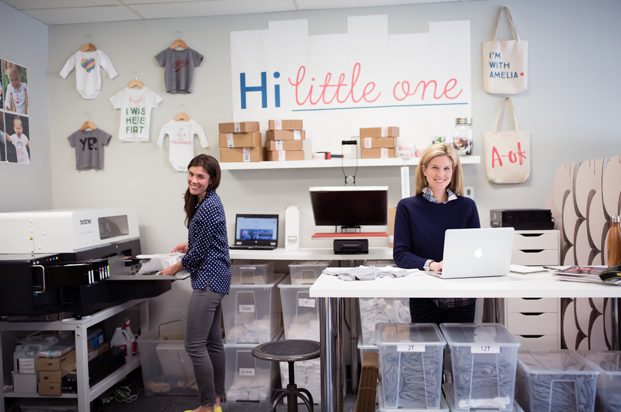 Using inside jokes, hometown nods and nicknames as fodder, Nell started making her own custom gifts with iron-on T-shirt transfers that were a step up from standard newborn and baby shower gifts. A whimsical design with a customized cursive name a makes a great gift! Please enter your personalization details in the Additional Options field. The baby's first name works best with this style. Available in: 3-6M, 6-12M, 12-18M. Neckband designed for easy on-and-off. Will shrink an average of one size when put in the dryer.100% Baby Rib cotton.